ADAM: The Inside Story has 2 major sections: a highly configurable anatomical drawing, and a folksy storybook. The anatomical drawings are excellent. The user has a choice of sexes, races, anterior and posterior views, and torso or full body. After these choices are made, the user then can choose from 12 different body systems, ranging from the cardiovascular to the urinary. 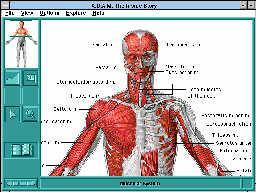 Body parts within each of these systems can then be shown with or without labels, or click to identify. These selections are made from a combination of buttons and pull-down menus. ADAM offers a lot of information about the human body, and its processes. Although clearly not a game, its clever use of animation and audio will be captivating for children with an interest in science in general, and human anatomy specifically. Young students who haven't previously displayed an interest in reading about science or medicine are much less likely to find this an interesting title.